This week on Fieldstone Common our featured guest is Jeremy D’Entremont, author of the book Ocean-Born Mary: The Truth Behind a New Hampshire Legend. Jeremy D’Entremont, author of Ocean-Born Mary, has been writing about and photographing the lighthouses of New England since the mid-1980s. He’s the author of more than ten books and hundreds of articles on lighthouses and other maritime subjects. He’s the historian for the American Lighthouse Foundation, founder of Friends of Portsmouth Harbor Lighthouses, and the webmaster of New England Lighthouses: A Virtual Guide which can be found at www.newenglandlighthouses.net. 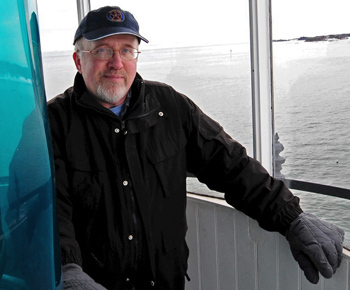 He is also the owner and tour operator for New England Lighthouse Tours. Jeremy lives in Portsmouth, NH. Meet Mary: ocean-born and named by an infamous pirate. Her birth saved a group of Scottish immigrants aboard a ship bound for New England in 1720. Halfway through the grueling voyage, pirates intercepted and captured the vessel. Upon hearing a baby’s cry, the pirate captain promised to spare the lives of all on board if the mother named her newborn Mary, possibly after his beloved mother. The ship arrived safely in Massachusetts, and Mary lived most of her long life in Londonderry, New Hampshire. Discover the house in Henniker, New Hampshire, that Mary is said to haunt and where a pirate purportedly stashed his treasure. Historian Jeremy D’Entremont separates the facts from the fantastic legends shrouding one of New England’s most enduring folk tales. Trade paperback; 126 pages with an appendix, bibliography and some BxW photos and illustrations. 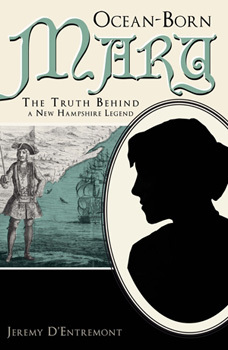 Ocean-Born Mary: The Truth Behind a New Hampshire Legend is available for purchase from Amazon.com and other booksellers. In this interview we dive into the original tale of Ocean-born Mary and follow the development of the tale in published forms through the years starting in the 1800s. In the 20th century a gentleman named Gussie Roy lived in Robert Wallace’s home which he called the Ocean-born Mary house. Gussie was responsible for many of the embellishments to the story. We also explore some ghost stories as well as the likelihood of which real life pirate was the inspiration for the tale. Heather Rojo, President of the Londonderry, New Hampshire Historical Society, has written a blog post (with photos) about Ocean-Born Mary to coincide with the release of this interview. Stop by her blog and see some artifacts from Ocean-Born Mary herself! Two copies of Ocean-Born Mary were given out to the Fieldstone Common audience courtesy of the the History Press. Question: What’s that’s new stuff in the Fieldstone Common title (FC 060)? Answer: That makes it easier, especially for iTunes and other podcast listeners, to keep track of which episode they are listening to. FC stands for Fieldstone Common and 60 is the number of the episode. This entry was posted in 18th Century, New Hampshire, The History Press, Ulster Scots and tagged Jeremy D'Entremont, Ocean-Born Mary by FieldstoneCommon. Bookmark the permalink.